Is your little one a fighter? Is he a contender? Do you think he has what it takes to make Ozeki? Maybe even Yokozuna? It's a tough road and you're going to have to start training your little one right away. You need to help him harness his inner warrior, you need to tap into his determination and, of course, you need to get him an adorable costume that will have him looking as fierce as one of the pros! This Infant Sumo Costume brings your baby a look based on the ancient Japanese martial art of Sumo. 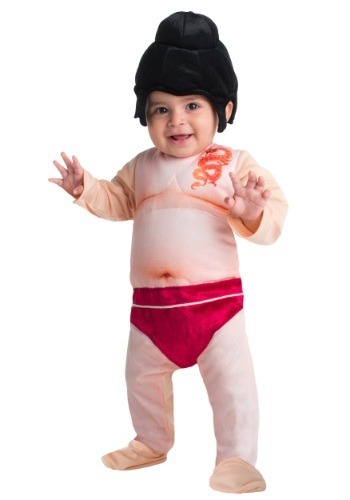 The costume is a full bodysuit costume that gives your child the image of a slightly plump fighter. It even has a dragon tattoo printed on the chest for an extra “tough” look. A pair of red trunks adorn the waist, assuring your child is always ready for a bout. Of course, you'll want to make sure your little one has some training under his belt before he enters the ring, but with a look like this, he's sure to get the drop on any of his foes!